Feeling great at mile 9! After completing my half ironman, I decided it was time to return to the marathon. My last attempt at finishing a marathon was derailed by a lower back injury. I started participating in triathlons because it gave my body a chance to heal. Well, it worked for a while… until I returned back to running full-time. It was right after my first 20-mile training run when the pain decided to rear its ugly head. The pain wasn’t in my back this time. It was in my knee. The first knee pain I have ever experienced during my duration as an athlete. Crap. The pain postponed training for a while, but I was determined to get to that marathon finish line. I rested, iced, elevated and compressed like nobody’s business. I cut back my mileage significantly for a full week and skipped one of my scheduled long runs. I made a visit to my doctor who told me that it was probably bursitis. I wasn’t so sure, but she was the doctor (I later found out that she was incorrect). She told me that the pain would subside if I rested. When I informed her I wasn’t planning on resting, she told me that she would refer me to an orthopaedic doctor if the pain didn’t go away in a few weeks. I returned to running full-time with a few setbacks here and there. Sometimes my knee would stiffen. Other times it would throb for the first few miles, but then just go numb for the remainder of the run. My knee would pop as I attempted squats or weaken as I went up and down the stairs in our multi-level home. Then there were times when I would feel nothing at all. I wondered if my knee had magically healed itself. Then the achiness or stiffness would return. It was kind of ironic that I suffered most after sitting for long periods of time and felt better after finishing a run. As the day of my last long training run approached I began to worry that I wouldn’t make it through. Yet, it ended up being the best 20-mile run I have ever had. My knee was achy for the first 5 miles, but then the pain lessened with each mile. Then, the following week I had to cut a run short because my knee felt weak while my other leg became afflicted with soreness due to the burden being placed on it. It was like a never-ending roller coaster ride. I never knew what each day would bring. I only hoped that I would be feeling 100% on the day of the marathon. I thought about my goal the night before the marathon. I really wanted to achieve that sub-4. However, I knew I had to be realistic about my knee. The next morning I felt okay. I couldn’t be sure of what my knee was going to do until I started the marathon. Then I began to worry about the other things that normal marathoners worry about. Would I be able to stay hydrated? Would I take in enough nutrition to avoid hitting “the wall”? Would I have the mental capacity to complete 26.2 miles? I forgot about my knee until I started running and realized that it wasn’t hurting. I wondered if it was going to be kind to me that day. Indeed, my knee was kind to me that day. My lower back was a bit achy and my quads felt like they were going to explode at one point, but I could handle all of that. I could take in the normal aches and pains associated with running a marathon. In fact, I felt so good physically that my mind followed. Initially, I feared that I had started off too fast. I was chugging along at a decent pace. After reaching the half marathon point, I was able to see that the 4 hour pacing group was nearly 2 miles behind me. It made me believe that my goal was possible. I felt so confident at mile 14 that I decided to change my goal. At mile 14 I heard a large group of runners coming up behind me. Then I saw it. The sign said 3:45. It was the 3:45 pace group. They came up behind me and I latched on with a relentless grip. At mile 15 I was still holding on. At mile 16 I couldn’t believe I was still running so fast. At mile 17 I believed that I could do it. At mile 18 I was awesome. 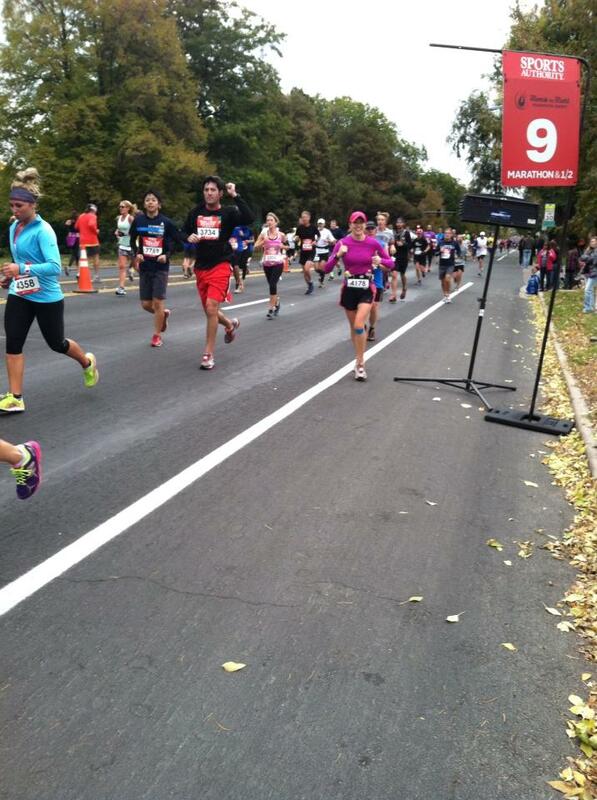 At mile 19 I continued to hold on. Then something happened at mile 20. I lost the group after we passed through the water station. They slowed down, but then quickly picked up a pace I couldn’t maintain. I wasn’t about to give up, but I sure did struggle. I watched them slowly fade away. Then, a lifeline came at mile 22. My friend joined me on the course and encouraged me to keep moving. I ran as fast as my legs could carry me. I kept my mind in a tranquil place. The miles went by and then I could see it: the finish line. The relief swept over me and I knew that I had achieved more than the goal I was hoping for when I started the marathon. I finished in 3:46:54. It was a time that well surpassed my last marathon time by 45 minutes. I was only 6 min 54 sec from qualifying for Boston. Now I know that goal is within reach (unless they change it again of course). I never imagined it would be. I postponed my visit to the orthopaedic doctor because I didn’t want to hear any news that would cause me to avoid the marathon. I decided that the perfect time to visit would be 2 days after my marathon because I assumed that I would definitely have symptoms. Well, my knee didn’t quite cooperate. Not only did feel just fine during the marathon, but it felt normal the day after. I thought for sure that today would be the day. I started my morning by running 8 miles. Then I went to the doctor. Nope. Nothing. He poked and prodded and did find one sensitive area. We explored x-rays and talked at length about my symptoms. The doctor eventually came to the conclusion that I have Chondromalacia Patella. He did a good job explaining it to me. In simple terms, the cartilage in my knee is getting soft. That isn’t the best scenario, but it isn’t the worst. There are ways to fix it. I told him I wasn’t planning to stop running anytime soon. Actually, I have another marathon in 3 weeks. I won’t expect my knee to cooperate, but I suppose I never know what is going to happen until it happens. For now, I will just enjoy my moment of glory. People say that they can’t do certain things because of genetics. Well, as you can see, genetics hasn’t been working in my favor but that doesn’t mean I am going to stop trying. 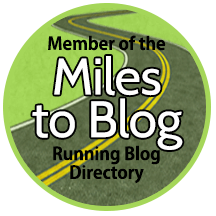 This entry was posted in Running Experiences and tagged Chondromalacia Patella, Denver Rock and Roll marathon, knee injury, knee pain, marathon, running, running with knee pain.